INM presents two awards at the annual state conference to recognize individuals who have dedicated their time and efforts to the improvement of notary education and outreach throughout Maine. This award is given in honor of the late Fred Robinson.Fred was a charter member and past president of INM. 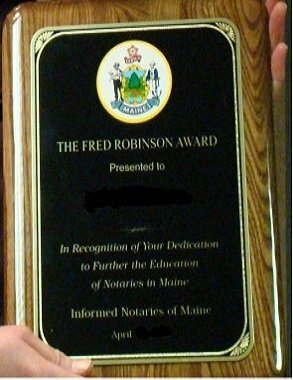 The award is given in recognition of the Notary Public who has done the most to further the education of notaries public throughout the state of Maine. This award is given in honor of a former Secretary of State and a charter member of INM, William Diamond. 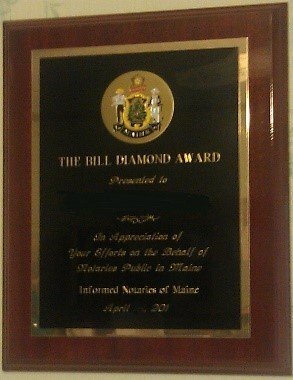 The award honors the individual who has made a major contribution to the Informed Notaries of Maine in the past year. On April 18, 2013, INM celebrated its 20th Anniversary. Traditionally, as noted above, INM presents two annual awards – the Fred Robinson Award and the William Diamond Award. However, this year, for the 20th Anniversary, INM created a special Platinum Award. This award was created in honor of an individual who has been instrumental to INM over the past 20 years. The Platinum Award (an engraved plate) was presented to: Sherry Tibbetts for her service and dedication to INM. Sherry is a dedicated INM member, an INM past president who served as President for 10 years and is currently a Director Emeritus. The very first INM member, who paid the first dues to INM, 20 years ago. Geraldine Mountain was awarded a bouquet of flowers. Geraldine has maintained her membership in INM without missing a year! Mr. William Diamond, the Secretary of State during the formation of INM, was presented with an INM pad-folio to recognize the role he played in the formation and support of our organization.